After a good bit of troubleshooting and searching, I found this article that says it applies to 11.5, but works for 11.7. Download the DLL file and throw it into your Acronis directory. The file was COMPLETELY gone from my directory, even after running a repair install. The next backup I kicked off went through 100% successfully. I ran into this issue at a client where we were forced to use an iSCSI connection for their backup. After upgrading to ESXI v6, the connection started showing as Normal / Degraded. After doing a number of troubleshooting items, I found an obscure forum post where it was claimed that ESXI will flag it as degraded if there is only one connection (ie. the connection is not redundent). I ended up un-bonding my NAS’s two NICs, added the “new” second NIC as a target for ESXI, rescanned the storage devices on ESXI, and voila… my degradation was resolved! I am in the process of decommissioning several DNS and Active Directory servers and wanted to make sure there were no undocumented devices on the LAN that were statically set to use one of the soon-to-be-decommissioned DNS servers. I figured the best way to do this would be to record all requests for DNS from the specific servers and it is fairly straight forward to do. 5. Ensure that the Incoming, UDP, Queries/Transfers, and Request check boxes are selected. To ensure that the server’s drive does not exceed capacity, make sure you set an appropriate file size limit! I had a user complain of some weird issues in RDP, the biggest one being that they couldn’t right-click in the taskbar. I found a few other reports of such issues and found the solution was to turn off hardware acceleration in the Options menu. Once I did that and restart Firefox, everything was working! Ran into this one today… and it is nothing you want to see happen on an Exchange server! I was re-assigning services to a new SSL certificate when I started getting this error. After doing some searching, I found the easy fix from Microsoft. 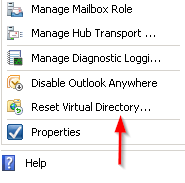 Under Server Config > Client Access, you can click Reset Virtual Directories on the far right. From there, you can choose which directories to rebuild (OWA, Autodiscover, etc.) Doing that fixed my issue for OWA! After troubleshooting a bit, I found that the error occurs if you have multiple sites binded in IIS to your Port 443. Make sure you have ONE site binded to 443 and you’ll be good to go! I recently enabled Azure Active Directory (AD) Connect and wanted to turn this feature on. After doing some reading, I found a simple way to enable the AD Recycle Bin. NOTE: Be aware this feature cannot be disabled. Click OK. Once enabled, wait for AD replication to complete as this is a change made on the configuration partition. This process may take a while should your organization have a large active directory infrastructure. A very simple enablement of a process that could save you hours of restore time. Again, this process cannot be reversed once invoked. On a new client’s server, I ran into an issue where a drive was running low on space and I found that another user account on the server (which had been deleted) had files in the Recycle Bin! You can append -Whatif to do a test run and see what files will be deleted before actually deleting them. I have an old XenServer still alive at a client and I needed to get its service tag. Using this command via the XenServer console, you can get it! Hit enter and you’ll have it!